Today is the day! Last week we put up two preview postings about the new miniatures coming from Loud Ninja Games through us here at 15mm.co.uk. 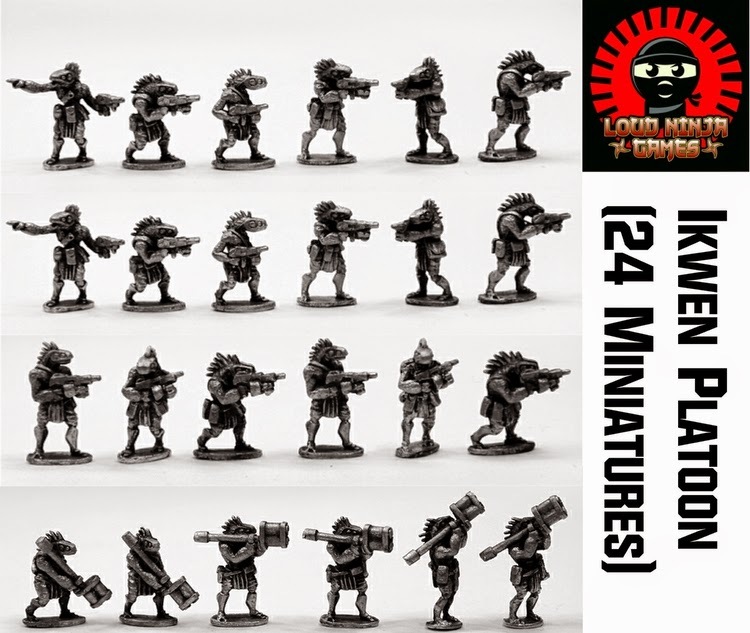 The Ikwen are now released and the three packs and the value platoon pack can be found on our website on the Loud Ninja Games Page. If you know all about it click on through and see them now and you can select which part of the range to see by using the search box on the page screen to narrow the selection to 'only Ikwen' or 'only Wasteland Mutants' if you prefer. If you missed the previous posting then you can see it by going HERE. This link goes to a great concepting and development posting where the history, society, weapons, hierarchy, armour and costume of the Ikwen are discussed and shown through text and artwork to a degree far beyond that which is typical in 15mm science fiction outside of game books. Well worth a read for Eli Arndt's words, Todd Ulrich's artwork and Roderick Campbell's sculpting. 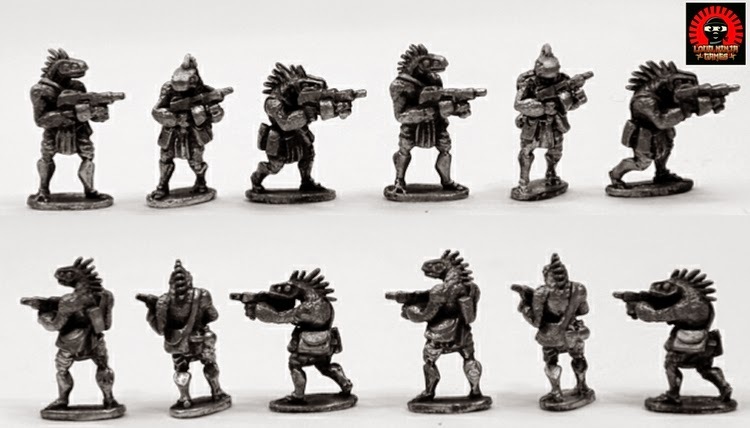 This pack contains six different white metal 15mm scale miniatures armed with Assault Rifles. This is the core pack upon which to build your forces. 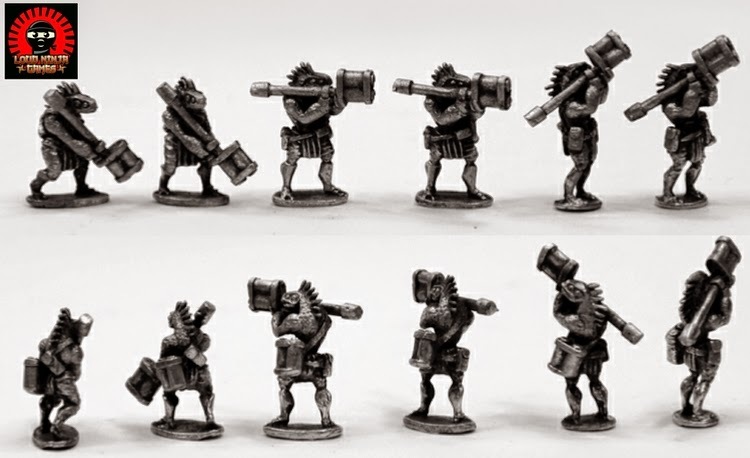 This pack contains six white metal 15mm scale miniatures in three different poses armed with Light Machine Guns. This is an infantry support pack for your forces. 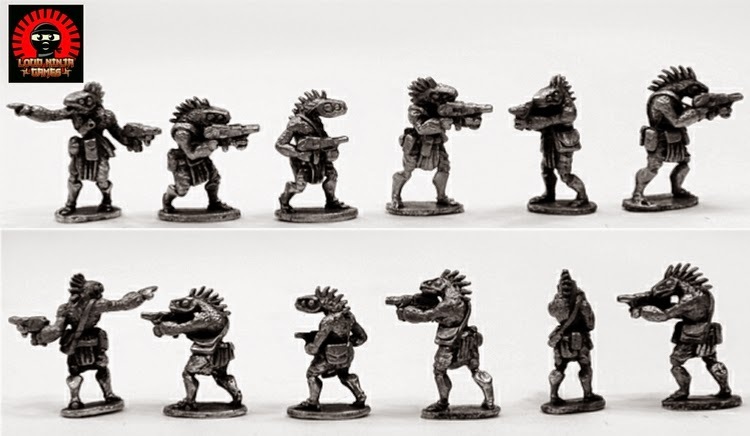 This pack contains six white metal 15mm scale miniatures in three different poses armed with twin tube Rocket Launchers. This is a fire support pack for your forces. This is a platoon value pack which offers you a complete force with a 5% saving off from purchase of the four packs that make it up. Contents are twenty four white metal 15mm scale miniatures. These are as follows: RAP016x2, RAP017x1,RAP018x1. Over a generation ago, the planet Kwiell was set upon by aliens bent on exploiting the natural resources of the planet. The planet’s native population, the Ikwen, found themselves suddenly enslaved and their society rocked as they were enslaved, put to work and in many cases hunted and killed. The Ikwen have spent decades in frustrated servitude to these invading overlords, hedging on their beliefs and their close-knit kinship ties to get them through. It was only when the invaders sought to remove their spiritual identities that they found the courage to rise up and go to war. The conflict began as acts of sabotage, ambushes and in some cases organized resistance but as time went on it grew into a very real, very active militia war. Weapons were procured through theft or the trade of the very resources they had been robbed of. Groups of soldiers took to the wilderness, the highlands and steppes where they enlisted the locals there into their fight. 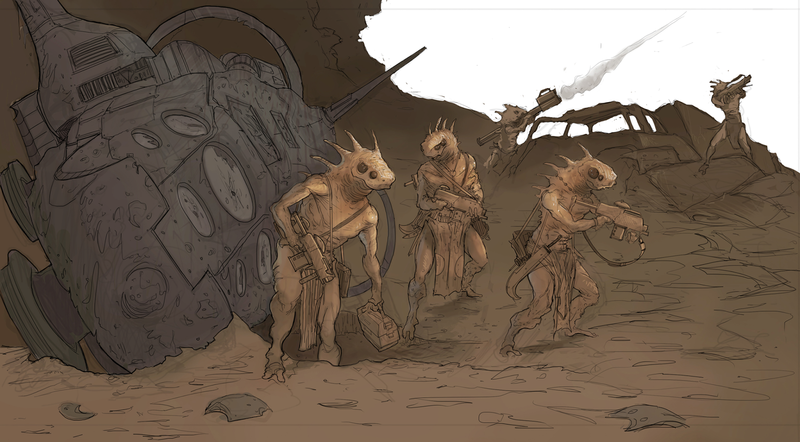 Ancient desert fortresses and settlements were once more turned into homes for fighters and their families. Ancient warrior traditions and less-spoken of factions found a renewed place in the world. The Ikwen are one side of an asymmetric war against a higher tech, invading enemy. They fight in a less organized, militia style, utilizing acquired weapons, not of their of own manufacture. While we see them as very much freedom-fighting indigenous life forms, use them as alien invaders, allies, mercenaries or even lower tech indigenous forces for more organized warfare.